T-STORM WTS301A – SOS Safety International Inc.
T-STORM WTS301A 1×3 AR-AFFF (Alcohol Resistant Aqueous Film-Forming Foam) Concentrate from Williams Fire & Hazard Control combines fluoro- and hydrocarbon-surfactant technologies to provide superior fire and vapor suppression for Class B, polar solvent and hydrocarbon fuel fires. T-STORM WTS301A 1×3 AR-AFFF (Alcohol Resistant Aqueous Film-Forming Foam) Concentrate from Williams Fire & Hazard Control combines fluoro- and hydrocarbon-surfactant technologies to provide superior fire and vapor suppression for Class B, polar solvent and hydrocarbon fuel fires. 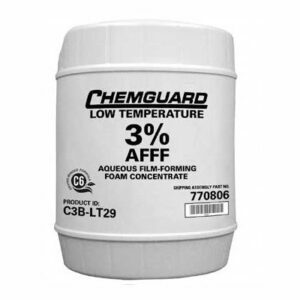 This synthetic foam concentrate is intended for forceful or gentle firefighting applications at 1% solution on hydrocarbon fuels and gentle firefighting applications at 3% solution on polar solvent fuels in fresh, salt, or hard water. T-STORM WTS301A Concentrate is a non-Newtonian fluid that is both pseudoplastic and thixotropic; therefore, dynamic viscosity will decrease as shear increases. The environmentally-mindful T-STORM WTS301A 1×3 AR-AFFF Concentrate formulation contains short-chain, C-6 fluorochemicals manufactured using a telomer-based process. 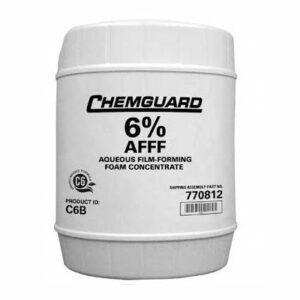 The telomer process produces no PFOS, and these C-6 materials do not breakdown to yield PFOA. The fluorochemicals used in the concentrate meet the goals of the U.S. Environmental Protection Agency 2010/15 PFOA Stewardship Program and the current ECHA Directive (EU) 2017/1000. T-STORM WTS301A 1×3 AR-AFFF Concentrate is intended for use on both types of Class B fires: hydrocarbon fuels with low water solubility, such as crude oils, gasolines, diesel fuels, and aviation fuels; and polar solvent fuels with appreciable water solubility, such as methyl and ethyl alcohol, acetone, and methyl ethyl ketone. The concentrate also has excellent wetting properties that can effectively combat Class A fires. To provide even greater fire protection capability, T-STORM WTS301A foam solution may be applied simultaneously with WILLIAMS FIRE & HAZARD CONTROL PKW dry chemical for a twin-agent system. When using a twin-agent application on polar solvent fuels, care must be taken with the velocity of the dry chemical discharge to minimize submergence of the polymeric membrane below the fuel surface. 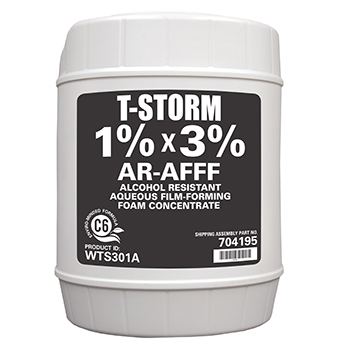 T-STORM WTS301A 1×3 AR-AFFF Concentrate may beeffectively applied using most conventional foam discharge equipment at the correct dilution with fresh, salt, or hard water. For optimum performance, water hardness should not exceed 500 ppm expressed as calcium and magnesium. T-STORM WTS301A Concentrate requires low energy to foam and the foam solution may be applied with aspirating and nonaspirating discharge devices. Non-aspirating devices, such as handline water fog/stream nozzles or standard sprinkler heads, typically produce expansion ratios from 2:1 to 4:1. Aspirating low-expansion discharge devices typically produce expansion ratios from 3.5:1 to 10:1, depending on the type of device and the flow rate. Medium-expansion discharge devices typically produce expansion ratios from 20:1 to 60:1. For immediate use: The concentrate may also be premixed with fresh or sea water to 1% solution for hydrocarbon fuel fires or a 3% solution for polar solvent fuel fires. For delayed use: Consult Technical Services for guidance regarding suitability of a stored pre-mixed solution (fresh water only). T-STORM WTS301A 1×3 AR-AFFF Concentrate should be stored in the original supplied package (HDPE totes, drums, or pails) or in the recommended foam system equipment as outlined in Johnson Controls Technical Bulletin “Storage of Foam Concentrates”. A thin layer up to 1/4 in. (6 mm) thick of appropriate-grade mineral oil may be applied to the surface of the foam concentrate stored in a fixed, atmospheric storage container to help minimize evaporation. Consult Johnson Controls for further guidance regarding the use of mineral oil to help seal the surface of AR-AFFF concentrates. The concentrate should be maintained within the recommended operational temperature range. Freezing of the product should be avoided. If, however, the product freezes during transport or storage, it must be thawed and inspected for signs of separation. If separation has occurred, or is suspected, the T-STORM WTS301A Concentrate should be mechanically mixed until homogeneous, and additional testing may be required after mixing to verify product quality. Factors affecting the foam concentrate’s long-term effectiveness include temperature exposure and cycling, storage container characteristics, air exposure, evaporation, dilution, and contamination. The effective life of T-STORM WTS301A Concentrate can be maximized through optimal storage conditions and proper handling. T-STORM foam concentrates have demonstrated effective firefighting performance with contents stored in the original package under proper conditions for more than 10 years. Mixing T-STORM WTS301A Concentrate with other foam concentrates for long-term storage is not recommended. Use in conjunction with comparable 1×3 AR-AFFF products for immediate incident response is appropriate. To help avoid corrosion, galvanized pipe and fittings should never be used in contact with undiluted T-STORM WTS301A 1×3 AR-AFFF Concentrate. Refer to Johnson Controls Technical Bulletin “Acceptable Materials of Construction” for recommendations and guidance regarding compatibility of foam concentrate with common materials of construction in the firefighting foam industry. 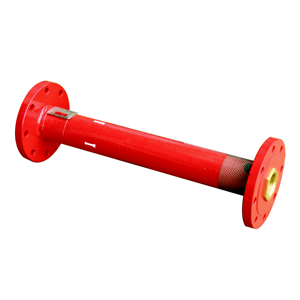 T-STORM WTS301A 1×3 AR-AFFF Concentrate should be inspected periodically in accordance with NFPA 11, EN 13565-2, or other relevant standard. A representative concentrate sample should be sent to Johnson Controls Foam Analytical Services or other qualified laboratory for quality analysis per the applicable standard. An annual inspection and sample analysis is typically sufficient, unless the product has been exposed to unusual conditions. T-STORM WTS301A 1×3 AR-AFFF Concentrate is subject to stringent quality controls throughout production, from incoming raw materials inspection to finished product testing, and is manufactured in an ISO 9001:2008 certified facility. T-STORM WTS301A 1×3 AR-AFFF Concentrate is available in pails, drums, totes, or bulk shipment.